The Sixth Sunday after Trinity found Sir John Eliot Gardiner and his pilgrims in Ansbach, where their concert was part of the Ansbach Bach week. Their programme included BWV 170, one of three cantatas for solo alto that Bach produced within the space of a few weeks in 1726, probably because he had the services of a particularly accomplished alto at that time. Michael Chance certainly comes under the heading of accomplished altos and he gives a very good account of the cantata. The heavenly, pastoral opening aria is phrased extremely well and Chance’s tone is very pleasing. I had a slight concern that, to my ears, he was a shade too emphatic in his delivery of some isolated words. I was very interested to learn from Sir John’s notes that when Bach’s son, Wilhelm Friedemann, proposed revising the cantata in 1750 he was only interested in performing this opening aria. I’ve always felt a bit guilty that I regard the rest of the cantata as something of an anti-climax and I’m slightly reassured to find that perhaps I’m not alone in this. Michael Chance sounds to be convinced by the rest of the music, however. He’s imaginative in the declamatory recitative that forms the second movement. He also sings the third section of the cantata well. Here, Bach’s rather stark accompaniment contrasts with the richer hues of an alto voice. The final movement is lively and more upbeat in tone and Chance and the players of the EBS turn in a spirited account of it. The programme opens with BWV 9, a cantata which I can’t recall hearing before. Alfred Dürr describes the opening chorus as “a highly spirited movement of multifarious motivic allusions.” It’s certainly an inventive composition and the Monteverdi Choir and the EBS give an agile and airy performance of it. The key movement in the cantata is the third one, an extended tenor aria. It was fascinating to read of the debate that went on in rehearsal between Sir John and his soloist, James Gilchrist. It seems that Gilchrist, who hadn’t sung the piece before, felt that a “fast, urgent delivery” was appropriate. Gardiner, on the other hand, “saw it more as a slow, contemplative dance, despondent and heartsick in its unremitting gloom and its emphasis on the death knell.” I think Gardiner’s view is supported by the words of the aria, which are certainly gloomy, although it’s interesting that Dürr says that the music “depict[s] a giddy descent into the abyss of sin”, a description which implies a certain degree of speed. In this performance Gardiner’s view prevailed and the bleak nature of the aria was emphasised by his decision to pare down the accompaniment so that only a single violin and a cello continuo are involved. The aria is an unsettling experience in this reading. I have to say, though, that while I tend to side with Gardiner over the conception of the aria I wonder if his chosen speed isn’t just a bit too lugubrious. The music doesn’t quite flow and even sounds a touch laboured at times while occasionally both Gilchrist and the two string players seem a little uncomfortable. A different mood is struck in the second aria, which is a duet for soprano and alto. This is a delightful and very cleverly constructed canonic movement in which not only the two singers proceed in canon but also the flute and oboe d’amore. Yet, despite the technical skill and intellectual rigour with which Bach has composed the movement, the listener is never conscious of this – which is down to the skill of the performers. Joanne Lunn’s singing is especially pleasing here. 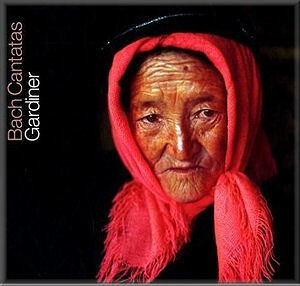 To conclude Gardiner offers us a re-working, attributed to Bach, of an impressive five-part motet by his predecessor in Leipzig, Johann Kuhnau. This funeral motet, Der Gerechte kommt um is tremendously intense and yet very dignified. The performance by the Monteverdi Choir is quite outstanding and it makes a genuinely moving conclusion to the programme. For the following Sunday the Pilgrims crossed the North Sea to Haddington, in East Lothian, a market town some twenty miles from Edinburgh. Their first offering, BWV 186, is a re-working of a cantata originally composed in Weimar in 1716 for the Third Sunday in Advent. In its revised form the cantata has eleven sections and is divided into two parts. The opening chorus is interesting not only because the music is of high quality but also on account of the slightly unusual construction. It’s in ABABA form and in the B sections the choir sings a cappella except for a bass continuo line. Stephen Loges, the bass soloist, impresses, as he has done in previous volumes. Tenor Kobie van Rensburg has also been heard before in the series. He sings his aria, ‘Mein Heiland lässt sich merken’, well though personally I’d prefer a voice with a bit more sweetness in the tone. Rensburg has a strong ring to his tone but it can sound a little harsh. Katharine Fuge sings delightfully in her aria ‘Die Armen will der Herr umarmen’. She also makes a fine contribution to the soprano/alto duet – a minor key gigue - that forms the penultimate movement of the cantata, though her alto partner doesn’t make as strong an impression. BWV 107 is rather an unusual cantata in that Bach took an old German hymn for his text, which he often did, but then set the text without alteration or paraphrase, something which, so far as we know, he’d last done as long ago as 1707 in the cantata Christ lag in Todesbanden, BWV 4. The present cantata, like BWV 186, opens with a fine chorus and once again this is excellently delivered. Loges manages to be both imposing and agile in his aria, ‘Auf ihn magst du es wagen’. That’s followed by a tenor aria, ‘Wenn auch gleich aus der Höllen’. The music is dramatic and fiery and this suits Kobie van Rensburg’s strongly projected voice very well. Then he lightens his voice appreciably for his second aria, the much more restrained ‘Drum ich mich ihm ergebe’ and the result is very pleasing. In between these two tenor arias comes a soprano stanza, which Katharine Fuge sings with much grace. The lilting orchestral accompaniment to the concluding chorale is a slight surprise – but a very pleasant one. Finally we hear another bi-partite cantata, BWV 187. The text is concerned with the harvest and the bounties of creation and with thanksgiving for them. The extended opening chorus begins with a lengthy orchestral introduction, which ushers in some very fine choral writing. The movement is expertly articulated by all concerned. Part I contains a bass recitative and an aria for the alto. I’m afraid that I didn’t warm much to Richard Wyn Roberts’ delivery of the aria; I found his tone on the thin side. Katharine Fuge, on the other hand, excels in the soprano aria in Part II. This is an interesting conception in which the singer – and her excellent oboe obbligato partner – present rather ceremonial music around a livelier central section. The music – and this performance – do indeed, as the text enjoins, banish worries. Incidentally, much of the music in this cantata was recycled by Bach some years later into the Gloria of his Missa in G minor, BWV 235. With one or two slight reservations about the soloists, this instalment in the Bach Cantata Pilgrimage is a worthy addition to the series. As usual Sir John Eliot Gardiner contributes a fascinating and illuminating note – though citizens of Ansbach may shuffle uneasily in their seats at his views on their rather stuffy approach to applause! As ever, the Monteverdi Choir and English Baroque soloists are on fine form. Those collecting this excellent series can once more invest with confidence.